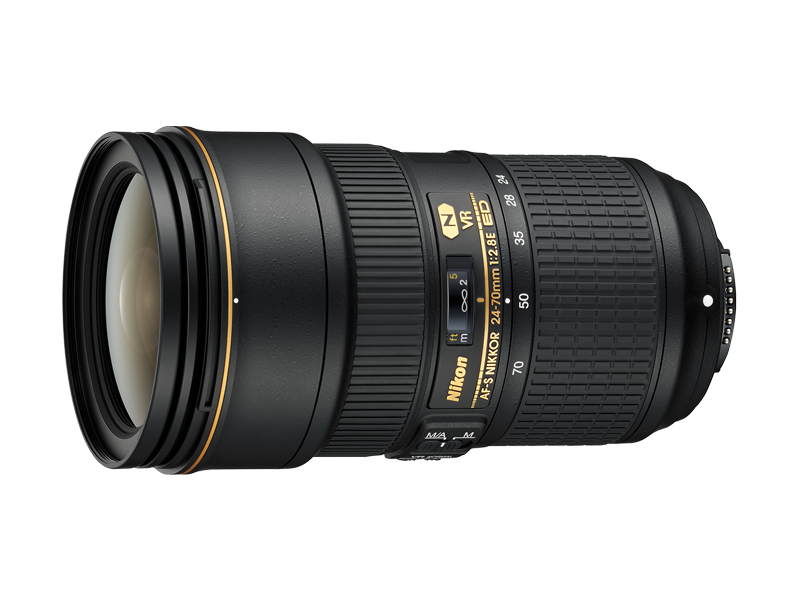 2.9x normal zoom with 24-70 mm* focal-length range and f/2.8 maximum aperture that delivers improved resolution and natural blurring. * When attached to a DX-format digital SLR, the angle of view is equivalent to that of a lens with a focal length of 36-105 mm in FX/35mm format. Aspherical ED glass, aspherical lens, ED glass and HRI lens elements plus Nano Crystal Coat are employed to achieve high optical performance with minimal ghost effect and chromatic aberration. Newly developed aspherical ED glass element provides superior rendering capability by maximizing the advantages of both ED glass and aspherical lens – effectively correcting various lens aberrations. Vibration Reduction (VR) provides an effect equivalent to a shutter speed 4.0 stops faster in NORMAL mode. * Based on CIPA Standard. This value is achieved when attached to an FX-format digital SLR camera, with zoom set at the maximum telephoto position. Highly durable body withstands the severest shooting environments of professionals. Even during high-speed continuous shooting, accurate AF tracking is achieved, while exposure is stably controlled with the adoption of an electromagnetic diaphragm mechanism. Lens barrel designed for improved operability and comfortable holding. Fluorine coat is applied to the extreme front and rear lens surfaces for enhanced durability and dust prevention.